Former Laker, Magic Johnson, speaking at Steiner Sports on Dec. 9, 2014 in New York, said he wants his former team to lose enough games to contend for a high lottery pick in next year’s NBA draft. Source: ESPN.go.com. 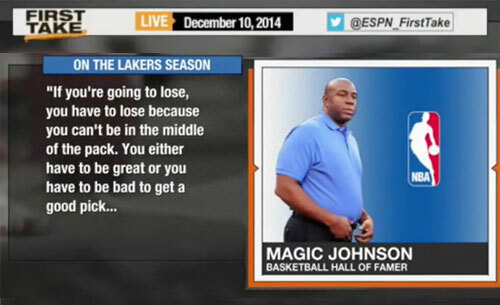 Magic Johnson says Lakers should keep losing to get high priority draft pick. “I hope the Lakers lose every game,” Johnson told reporters. “Because if you’re going to lose, lose. And I’m serious.” The Lakers owned the second-worst record in the Western Conference and the sixth-worst in the NBA following Tuesday’s 98-95 victory over the Kings. Watch the video where Kobe Bryant responds to Magic Johnson’s comments. “He’s used to being an owner. He’s an owner of the Dodgers. He was an owner of the Lakers. That’s speaking from an owner’s perspective,” Bryant said. “I think the fans — or hopefully some of them — are probably smart enough to understand his perspective as an owner. I certainly am. As a former point guard for the Los Angeles Lakers, Magic led the Lakers to five NBA titles, was part of the Olympic Dream Team in 1992 and was inducted into the Basketball HOF in 2002. During his career, Magic achieved five NBA championships and three Most Valuable Player Awards. In 1994 he began his first year as the Lakers’ Vice President. In 1996 he was voted one of the 50 Greatest Players of All Time by the NBA, and in 2002, he was inducted into the Basketball Hall of Fame. ESPN’s Sports Century ranked Johnson #17 in their 50 Greatest Athletes of the 20th Century. In 2006, ESPN rated Johnson the greatest point guard of all time. Sports Speakers 360 is a booking agent for pro athletes. If you would like to book Magic Johnson for a speaking engagement, appearance or endorsement, contact Magic Johnson’s booking agent for fees at 1.855.303.5450.